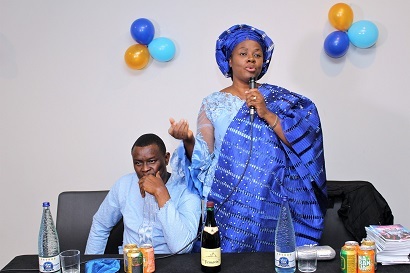 The successful actress and co-founder of Mount Zion Faith Ministries, Evangelist Gloria Bamiloye has described a glorious home as a home that God resides in. She disclosed this recently at the Couples Luncheon held at Ibadan organized by Vision Carriers. Gospel Film News correspondent who was live at event reports that the actress who used 2 Sam 6:10-12 as reference stated that a glorious home is a home that makes room for God, an extension of God’s presence. She further noted that getting married can be liken to carrying the ark of God, adding that the marriage institution is like the ark of God which is meant to bring joy and defense. Bamiloye disclosed that a home supposed to bring joy, peace, enlargement, saying God’s plan for home is to make it an extension of His name, adding that mystery of marriage goes beyond this world. “Inside every home is a deliverer. Satan hates Godly family. God’s glory will be in the home that is ready to accommodate His presence. There is hope for any marriage; God can still use it to His glory. Don’t believe the lies of the devil about your marriage. There is a proper way to carry the ark (marriage). The moment you agree with a man in marriage, you enter a covenant with God,” she added. The gospel actress noted that God loves it when you carry him along in your marriage, saying marriage is a ministry, it is like a service unto God, and it is a calling. Bamiloye concluded by listing how to have a glorious home as Know your God; having spiritual maturity; living a life of Holiness; Becoming a blessing and giving God Praise and Worship.